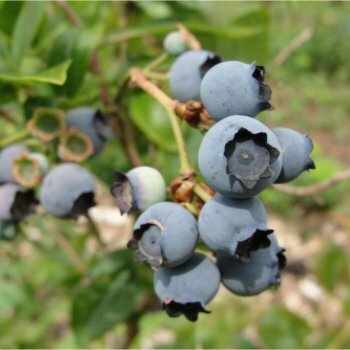 This Blueberry plant will produce large, delicious light blue blueberries with a good flavour. These blueberries are ideal for eating fresh or cooking in pies and cakes. The striking red autumn leaf colour and pretty, bell-shaped creamy white flowers make this Blueberry bush pleasing on the eye as well as the palate. Acidic soil or compost is a must when planting blueberries, so make sure you dig some in to the planting area or use lots of ericaceous compost in your pot if you are growing your blueberry on a patio. If you are growing in a container then a top tip is to water with rainwater for best results. Why not try baking homemade blueberry, raspberry and white chocolate muffins - delicious. Blueberry bushes should be planted at a minimum of approx. 1m between plants. When planting blueberry bushes, such as the Bluecrop variety, it is important to prepare the planting area well. Pot grown blueberry bushes can be planted at any time of the year. Bare root blueberry bushes need to be planted between November and March. If you are not planting your bare root blueberry tree straight away, it is best to ‘heel in’ your tree. Dig a hole in an unused area of soil and pop the roots of the tree in, gently firming around. If you’re planting within a couple of days, you can untie the bag around the roots, water, re-tie and then store in a frost free garage or shed. Whether planting a pot grown or bare root blueberry tree it is important to prepare your planting site well. Start by removing all weeds and grass within a metre of your desired planting hole. Then dig a hole slightly deeper than your root mass and approximately 2x as wide. We recommend digging a square hole as this encourages the roots to grow straight as opposed to around inside the hole. To help your tree establish more effectively, we advise applying root grow (sprinkle in the hole for pot grown trees or prepare and apply the gel mixture for bare root trees), especially if you have poor soil. Gently loosen the roots and place into the planting hole. Using 50% of the original soil and 50% compost (avoid multi-purpose and ideally use an ericaceous/acid compost), fill in the hole and firm around gently. Make sure not to bank the soil up around the collar of the tree as this can cause problems. If you’re planting in dry weather, water well and regularly for the first few months – Blueberries are acid loving and so rainwater in by far the best thing to water with. The same goes for spring and summer planting. Make sure to keep an eye on your young blueberry and increase watering if there are extended periods of hot or dry weather. If you’re planting in autumn, you may only need to water your plant a little. To check if the soil requires further water, dig a finger down into the soil, a few centimetres and if the soil feels even slightly moist, it does not need further watering. If it feels dry, water and repeat this test again. Once you see your fruits begin to swell, water again. We also stock a range of irrigation kits, suitable for a variety of planting schemes. Once planted, it is important to keep the area free of competing weeds and grass for the first couple of growing seasons. Using a glyphosate based weed killer or installing mulch matting and bark chips will aid in this. Do not simply mow the grass around the area as this will only encourage it to grow more vigorously. Blueberries grow from the short side shoots of the previous year’s growth in spring or early summer. A late, second crop is then produced on the tips of the current year’s growth. Only a minimal amount of pruning is required in the first couple of years. Simply remove any crossing or awkwardly placed branches that prevent an open centred bush habit. Prune from November to March, in the dormant season. Mature blueberry bushes should be checked for dead, dying or diseased branches. Remove one third of the oldest stems near the base of your mature blueberry bush.